If you have read more than one K575 vs K475 review before, then my comparison will disappoint you. Because most of the other popular reviews that compare the Keurig K575 and the K475 have got several things wrong. For instance, one of the biggest mistakes that I have seen is that a key difference between the K575 and the K475 is that the former has customisable wallpaper and the latter doesn’t. That is wrong- plain and simple. Both models have customisable wallpaper. And if you read the last part of the Key Features section on this page, it will prove it. Moving swiftly on, let’s take a look at the real key differences. As far as I can make out, there are seven differences between these two single serve coffee makers. Price Most of the time, the K575 will cost more than the K475. Water Reservoir the K575 has an 80 oz. capacity and the K475 has 70 oz. capacity. Hot Water the K575 has an option to dispense hot water only, whereas the K475 hasn’t. Screen Size Both machines have color touchscreens but the K575 has a 2.8″ screen, the K475 has a 2.4″ screen. Nightlight The K575 has a nightlight that illuminates the water reservoir in the dark. The K475 doesn’t have this. 18 oz. Brew The K575 is capable of brewing an 18 oz. mug of coffee, whereas the K475 can’t. Bonus Gifts While the K575 offers no extras at all, the K475 comes with 6 K-Cup Pods, a Water Filter Handle, and 2 Water Filters. And now, let’s take a look at what similarities these two machines have. In so many different ways, these two Keurig machines are identical. Both the K575 and K475 will brew a cup of coffee in just under a minute. Having a variety of sizes to choose from is also something else which coffee lovers find important from a coffee machine and you can’t go wrong with either the K575 or the K474 in this area. As was mentioned above, the K575 can brew an 18 oz cup of coffee and the K475 can’t. Both coffee makers offer sizes of 4oz., 6oz., 8oz., 10oz., 12oz., 14oz., 16oz., 22oz., 26oz., and 30oz, giving you plenty to choose from. Both of these machines have the option of choosing between five different temperatures. Both of these coffee makers give you the option to brew either a regular or a bold strength of coffee. This feature allows you to program your brewer to turn on or off automatically at set times. This feature is different to the auto on or off function because it allows you to turn off your machine automatically when not in use. Like a type of coffee brewed at a certain temperature, size and strength? Then save it! You can store up to five favorites. These will tell you when the K575 and K475 need to be descaled or have their filters changed. The removable drip tray is a useful feature for more than one reason. The first and most obvious reason would be the fact that it makes for easier cleaning and removal of the excess drips, while the other reason is that when you remove it, you can fit a taller cup in there. This is an area of mass confusion in many of the reviews that I have looked at. As was said earlier, both the K575 and K475 have different color “wallpaper” that can be chosen. These wallpapers are the colored background on the touch screen and there is a choice of 16 different colors and patterns. And those are all of the many ways ways in which the Keurig K575 and K475 are similar. To finish off this comparison, it is time to look at the pros and cons of each model. Water Reservoir – The 80oz. Water reservoir that you get with the K575 means more cups of coffee and less time refilling. Brew Time – Bringing you a cup of coffee in under a minute is definitely a plus for any coffee machine. Auto On/Off – If you forget to turn the K575 off then you don’t have to worry about it, as it will simply turn off itself. Taste – It seems that there have been many complaints about the taste of the coffee, with a general consensus being that it tastes of plastic. Quality – There have been some quality issues with the K575, with many suggesting that it is unsafe or needs to be recalled due to poor quality. No Extras – Having no added extras is a big let down with any coffee machine and is likely to lead to lose of sales. Controls – The good sized touchscreen display makes for much easier control when deciding on your brew. Extras – The K475 comes with plenty of nice little extras that you can take advantage of right away. Taste – While there is the odd complaint about taste, it seems that the general consensus is that the K475 makes a great cup of Joe. Cleaning – The fact that the K475 is not a self cleaning coffee machine means it can be quite difficult to clean at times. Durability – Some have found that the K475 seems to lose some power after a while, meaning an upgrade might be required sooner than expected. Noise – It has actually been difficult to find many issues with the K475 but it seems that it might be a bit too noisy for some people. While the K575 does have some fancy new features, like the customizable wallpaper and the night light, as well as a slightly bigger water reservoir, it really is missing a trick by not offering the extras. As well as that, the fact that there have been complaints about it being dangerous and the price you have to means it is not worth the money. Meanwhile, the K475, while there are some slight durability issues with it and it can be noisy and difficult to clean, it still makes a much better tasting brew and, as well as being better in so many departments, it just looks that bit better. Oh and the fact that it comes with extras and is still cheaper helps. When it comes to working in an office, no matter how big or small, one of the most important things that you can do in order to improve the productivity of your workers, is to give them a good quality coffee machine in the break room. There are so many different coffee machines available to choose from today and here I am going to give you a few of the most important things you are going to want to look for when it comes to choosing the right office coffee machine. When buying a coffee machine, you want to make sure it stands out and makes a good impression, which can impress not only your workers, but also current and potential clients you have in for meetings. A lot of the cheaper and less quality coffee machines have a tendency to break down from time to time, which means having to go without a coffee machine while it gets fixed. So make sure that the coffee machine you get for your office is reliable. If you only have a small break room in your office, then you are going to want to go for a smaller coffee machine and there are some great ones out there. However, if you have a big break room, then you might even want to consider getting more than one. There are two main different water supply options you can get with coffee machines these days, by either having the machine plumbed in or by having a machine with a water reservoir. So make sure you know which coffee machine is going to be the most practical one for your office break room. We already mentioned that you are going to want to get a coffee machine that is very reliable but everything has a chance of breaking down at some point, so make sure that you get the best warranty possible for the machine you go with. Cleanliness in the workplace is of huge importance to any business of any size and the break room is no exception. With that in mind, you really need to go for a coffee machine that is going to be easy to clean. With a busy office and work environment, comes a busy break room and you do not want people having to queue up to use the coffee machine. It is therefore a good idea to find one which will continue to work with minimal fuss. As well as having to be low maintenance and needing to work with minimal fuss, your office coffee machine is also going to need to be hard working, as it is highly likely that it is going to have to make dozens of cups of coffee every day. If you want to keep your employees happy and motivated and working to a high standard, then you will be amazed what a difference a quality coffee machine can do. With quality coffee available, you will see productivity increasing dramatically. While it is fair to say that the majority of office workers do prefer to enjoy a nice cup of coffee, you do also need to make sure that you cater to everyone’s needs. Not everyone is a coffee drinker, so make sure that you get a machine that can also do tea and hot chocolate. Those of us who love a quality cup of coffee most likely have a coffee machine at home and have used many over time, so we know how they work. However, if you have employees who are not used to coffee machines, then try to find one which is very easy to use. A coffee machine needs to be so much more than just a coffee machine, so make sure that you go for one which is really going to stand out and look good. After all, nobody wants a cup of Joe from a drab looking machine. So there you have it. If you are an office manager or a business owner; If you are looking to reward your staff and keep them highly motivated, or you just want to impress your current and potential clients, then make sure that you get the best possible coffee machine you can, taking on board the points I have made here. After all, nobody wants to see an old fashioned coffee machine that has a carafe full of coffee sitting on a hot plate, or an urn dispensing huge amounts of drab coffee. So make sure you think carefully when buying that new office coffee machine, as it could really make a huge difference to your business. When it comes to the everyday morning routine, there are hundreds of millions of people all over the world who have to have their morning cup of coffee in order to get them out of that zombie feeling and ready for whatever the day has to bring. While that first cup of coffee before you leave for work is the best cup of the day, there is no denying that we all start to crave more coffee as the day goes by, but some workplaces and offices actually do not have a coffee machine in their break room. This seems absolutely crazy to me and I am going to give you a few little reasons as to why every workplace should have a coffee machine for their coffee lovers. When you have an office or a workplace which has even just a handful of employees there, you can pretty much guarantee that each and every one of them is going to have their own individual tastes and want something different. Heck, there are even times when I like to mix it up a bit myself and go crazy by having a cappuccino instead of latte. By having a coffee machine, you can offer your employees, and even your current and potential clients, a nice variety of coffee, so that there is a little something for everyone, keeping that workplace morale high and boosting the performance of your staff, even after their break. We have all been there at some point and a lot of people find that they experience it every day, due to not getting more coffee inside them as the day goes on, and that is mental fatigue and a lack in productivity as the hours pass by. Why do your employees always arrive at work with a spring in their step but then begin to fade in the afternoon? Well, it all comes down to the mental stimulation that we get from a simple cup of coffee. Just by having that coffee machine in your break room, you will see a drastic improvement in productivity from your workers, and also from yourself too. There was once a time in the working world, where people would go and have a chat by the water cooler, and while these meetings do still occur in some offices and workplaces, it is now fair to say that people much more prefer to do it with a cup of coffee. There are some bosses who feel that staff chatting over a cup of coffee is simply timewasting and needless gossip but it is actually a great way of networking and team building. Having your team members talking to one another not only encourages and improves their relationships as work colleagues but it also enables them to discuss things about ongoing projects, keeping everyone in the loop. And what better way to do that than over a cup of coffee. By now I am assuming that you are asking yourself why you would need a coffee machine, when you have a kettle in the breakroom already, and people can help themselves to instant coffee. Well it is quite simple really. The better the cup of coffee, the happier the employee. With a good quality coffee machine and a nice selection of different coffees, you are going to see a much happier and proactive workplace. So go and get that new coffee machine that has just hit the market, you know it makes sense. In the following section I have reviewed six different Keurig coffee makers, all of which are ideal in office environments. The first three machines I have reviewed are the K150, K150P and the K155. And I was surprised by how much confusion there is about these machines. The trouble is that they are nearly identical, which is troublesome because many reviewers just dismiss them as being the same machine in terms of looks and functions. 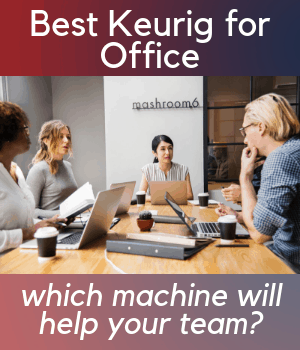 But there are subtle differences between them which you need to know about because it will help you choose exactly the right machine for your office. Firstly, let’s have a look at the K150. I won’t display a list of features because the K150 and K150P are almost identical. In fact, look-wise they are identical as they have the same coloring and they are identical in terms of their dimensions. The one difference between them is related to water. Both models have a huge 90 oz. water reservoir but the K150P comes with a pre- assembled plumbing kit that can connect it directly to a water supply. And so, if you are stuck between the K150 and the K150P then perhaps the deciding question is, how much coffee will be consumed in your office? The water reservoir in the K150 holds enough for about 18 servings. If the amount of coffee that is drunk far exceeds that amount, you might want to buy the K150P. And then, phone a plumber to install it for you! The K150 can also be connected to a water supply but in order to do this you will need to buy the plumbing kit separately. One last thing to add to the confusion is that the Keurig K150 is identical to the B150! And now, let’s find out about the K155. There is no need to write a bullet point list of features for the K155 because it is almost identical to the K150 and the K150P. But there are three differences. An obvious physical difference is that the K155 has a silver colored “brewhead” whereas the K150 and the K150P have a black brewhead. All three models have exactly the same dimensions- 13.9″ (H) x 14.0″ (D) x 10.4″ (W). 2. The K155 has a 90 oz. water reservoir and it cannot be connected directly to a water pipe. As we found out earlier, the K150P and the K150 can be. If you are running a small office of around 15 people or less, then the Keurig K140 would be ideal for you. The machine gives you the option of thee different cup sizes ( 6oz., 8oz., and 10oz.) while it also comes with a faily impressive 48oz. water reservoir, which means less need to refill so often. I found that the Ekobrew reusable filter works perfectly for this model too, giving it an even better tasting cup of Joe. And the fact that it brews in less than a minute means no waiting around. Oh, and I have to give a big shout out to the easy draining tank, which drains at just the touch of a button. How cool is that? If you are after a rich, smooth and delicious cup of coffee which delivers every single time, then I would have to recommend the Keurig K575. As well as offering the user a choice of multiple different cup sizes, for K-Cup, K-Mug, and K-Carafe, you are also in control of the temperature. Meanwhile the machine also offers a strength control option, allowing you to go for that strong cup of Joe. The large touchscreen makes for use and the 80oz. water reservoir means less time wasted refilling. You can also use a variety of top brand coffee pods, while it also caters for tea, hot chocolate and much more. As you can tell, I absolutely love the K575 and would recommend it to absolutely anyone. K- Cup Sizes: 4oz., 6oz., 8oz., 10oz., 12oz. K- Mug Sizes: 12oz., 14oz., 16oz., 18oz. Carafe Sizes: 22oz., 24oz., 30oz. And lastly, we have the K3000 SE. This is the King of Office Coffee Machines and it is designed to be used in large offices. Back to back brewing in less than 1 minute. When I wake up in the morning, one of the most important things in my daily routine is getting that first cup of coffee in me, knowing that there will be plenty more to come throughout the day. And it seems that I am not alone, since there are around 1.4 billion cups of coffee poured every single day, all over the world, showing just how popular coffee has become. But, when it comes to finding that perfect cup of coffee, from the perfect coffee machine, who are you going to go to? Those of you who are big time coffee drinkers will already know the name Keurig, since that are arguably the biggest and best name on the coffee machine scene, with a wide range of different coffee makers to their name. One of the most recent and exciting coffee machines to come to us from Keurig is the K15, which has already been earning rave reviews and it is easy to see why. Here I will give you a run down of what to expect from the K15 and whether it is the right coffee machine for you. First up is the machine itself, which is one of the smallest and most compact coffee machines to ever hit the market, with some suggesting that there is only one other coffee machine in the world which is actually smaller. So, if you have been searching for a new coffee machine for your kitchen but have struggled to find the space for one, then maybe the Keurig K15 is the perfect machine for you. As well as being nice and compact, the Keurig K15 is also very simple to use, taking away any of the confusion that so many coffee makers seem to have these days. When it comes to the Keurig K15, there is only 1 button to press. 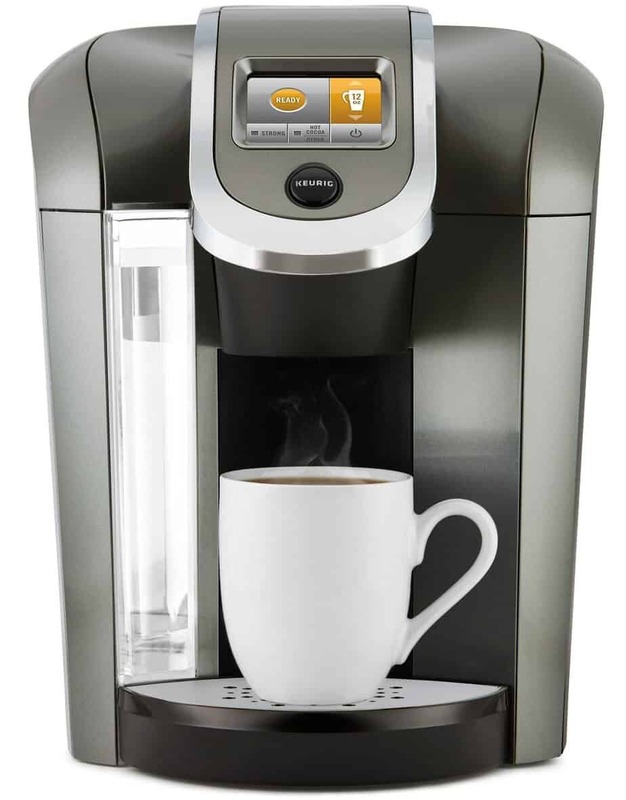 You simply plug it in, turn it on, add your water, choose your desired K-Cup and then press the “Brew” button. After around 2 minutes, you coffee is good to go. It really could not be any simpler than that. When it comes to choosing the cup size, there are three different options, with the Keurig K15 allowing you to either use a 6oz, 8oz, or 10oz cup in connection with you K-Cup Pods. If you are after anything bigger, then you can always remove the drip tray to fit a larger cup in. But it will be a bit of a squeeze if you want a big mug of coffee or if you are after a travel mug of coffee, due to the compactness of the machine. Another great feature of the Keurig K15 is the fact that the machine actually turns itself off, just in case you forget to do it yourself, so you don’t have to panic if you realise that you left it on. The Keurig K15 stays on for around 9 minutes before it does shut itself down, just in case you had left it on to make another coffee. After all, the machine is small and can only make one coffee at a time before you need to refill the water tank. So, by now you must surely be wondering about the taste of the coffee, right? Well Keurig have always been known for making a decent cup of coffee and the K15 is no different. Unfortunately though, decent is still quite a way from great. If you are just after an easy, middle of the road cup of coffee, then the Keurig K15 is ideal but don’t go expect anything great from it, as it really is just about average. With that said though, for the size of the machine you really can’t complain. While the Keurig K15 that I have been using (I bought it a few months back now) has never really had any issues, there are some who have complained that they started to experience some technical faults with their machine after a while. There was a recall on a number of the early Keurig K15 releases but it seems that they got those issues fixed and all is as it should be. So those still experiencing technical issues have probably still got one of the early machines. As I said, I have not experienced any issues myself and I have no complaints about how it works. So let’s break it down and give you a list of the Pros and Cons of the Keurig K15. Teeny Tiny – Gone are the days when the coffee machine took up a huge amount of the kitchen counter and the Keurig K15 is proof of that. The compactness makes it perfect for any kitchen, no matter how small. Easy Peasy – I am willing to say that there is not a coffee machine in the world which is as easy to use as the Keurig K15. It is impossible to get confused about anything, as it is all so easy with just 1 button to press. Value – There are a lot of coffee machines around today which are competing at the low end of the market but there are none which come as close to the value for money you will get from the Keurig K15. It really is money well spent. Drip Tray – The removable drip tray does not only make it easy to keep your Keurig K15 coffee machine clean but it also helps when you are looking to get a taller cup of coffee in there, for a bigger brew. Water Refill – The fact that the Keurig K15 is one of the smallest coffee machines to ever be released means that the water tank also needs to be small. With the ability to only make 1 coffee at a time, it can sometimes feel like you are forever refilling the water tank. Tick Tock – Some people might feel that 2 minutes to brew a coffee is perfectly fine but when I am in a rush I simply don’t have the time to wait for it. I like my coffee quick, so the waiting around can drive me a little loopy at times. Flavour – As I mentioned, for the size of the machine it does still make an OK cup of coffee but if you are someone who likes a coffee packed full of flavour, then this is definitely not the machine for you, as it is simply average. Size – Yes, I know I said that the size is a Pro of the Keurig K15 but it is also one of the cons too. While it is great that it can squeeze into the tiniest of kitchens, it is also a bit of a pain that you cannot get a big mug of coffee from it. If you fancy yourself as a bit of a coffee connoisseur then the Keurig K15 is definitely not for you. The lack of flavour and average taste that it delivers will leave the big time coffee lovers out there a little disappointed. Also, if you are living in a house with a lot of people who all love a morning coffee together, then again this is not for you. The 2 minutes it takes to brew 1 cup of coffee means that the first cup will be cold before the last cup is made. So who is the Keurig K15 ideal for? Well, if you have a small kitchen or you are worried whether you have the space for a coffee machine, then the Keurig K15 is perfect for you, taking up little space at all. If you live alone or only have 1 other person living with you, then the Keurig K15 could also be just what you need. If you have a mobile home or a caravan and love to take short breaks away, then this is really perfect for you. 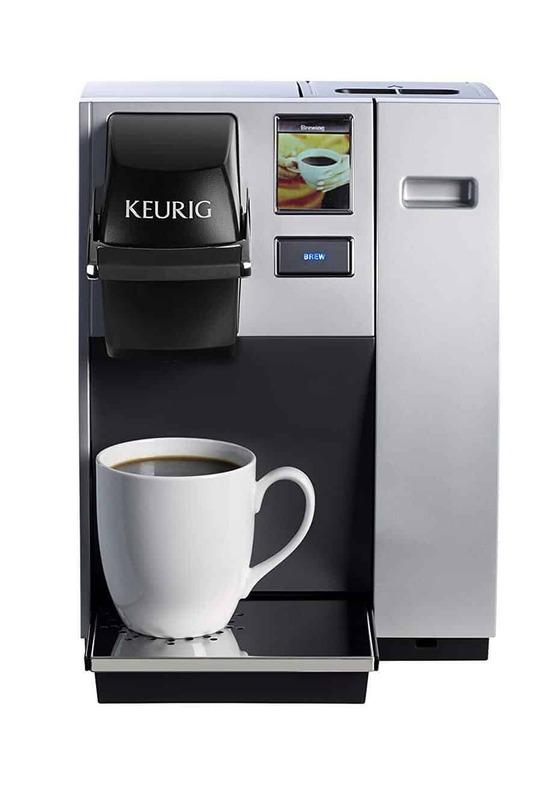 And finally, the Keurig K15 would be perfect for any office space, taking up almost no room and allowing for little coffee room chats while you wait for it to brew. If I had to give it an official 5 Star rating, then I would have to say 3 Stars. It is not perfect but it is good at what it was designed for. No matter how many different techniques and brewing methods there are, coffee lovers are united by one thing- the search for the perfect cup of coffee. And in this post, I want to look at a question asked by owners of one of the biggest brands of coffee making machines in the world- Keurig. Which is the best reusable K cup for stronger coffee? Many reusable K cup fans are struggling to make a decent cup of coffee with their reusable cups and are getting frustrated. I mean, it can’t be that hard can it? Is there a reusable K cup on the market that will guarantee a full bodied and tasty cup of coffee that is worth getting out of bed for? And the answer is? “Yes (almost)” and here it is. VAST KEURIG MODEL COMPATIBILITY: Whether you're the proud owner of a first generation, Keurig 1.0 brewer, or have one of the latest Keurig 2.0 machines, our reusable K-Cups are made to work with ANY Keurig brewer, new or old! So even if you have two Keurigs at home, or a different machine at work, our reusable cups will help you enjoy your favorite brews, anywhere you might be! Cups fit anyway you insert it unlike other designs! and No Need to swap Out The Keurig Filter Holder. FINEST QUALITY REUSABLE K CUPS ON THE MARKET: Our cups are made in an ISO 90001 Certified Factory, using the best quality, 100% BPA Free plastic, which is also 100% Dishwasher Safe! Featuring a tight seal, the DéliBrü Reusable K-Cups ensure no leaks or messes, while they ensure even water dispersion, helping produce the best brews you ever had! Refillable K-Cup - FLAWLESS DESIGN, ZERO HACKS! : Forget video tutorials, online tips and using inferior reusable cups that require several brewer modifications prior to use! 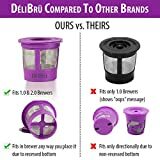 DéliBrü's superior Reusable KCups are a perfect match for your Keurig, providing you with a hassle-free, convenient, fill-and-brew experience! Further down, I compare this cup with two other reusable K cups. However, just relying on a well designed and made cup to guarantee you a strong cup of coffee, would be a bit naive because there are other factors to consider. After all, as well as wanting a stronger cup of coffee you are also interested in making a perfect cup of coffee?! How To Make Strong Coffee With a Reusable K Cup? There are four basic principles that you should follow in order to make a stronger cup of coffee with your K cup. I have also included a bonus tip at the end, which involves a bit of a DIY hack. The first principle is to make your coffee grinds finer. If everything else is equal the smaller the coffee grind, the faster that it releasing its flavours, oils and compounds into the hot water. But it isn’t as simple as grinding your beans as finely as possible. There is a trade off to be made. If your grind is too fine, it will either just block the filters in your cup or the coffee in your cup will taste very bitter indeed. This bitter taste is caused by over extraction- when the coffee grind has released not only all of its beautiful flavours but also some of their nasty tasting by products. And so the important thing to do is to gradually grind your coffee more finely, cup by cup. This gives you the best chance of hitting your cup’s “sweet spot”- when the grounds are small enough and have had enough time to only release their best flavours and nothing more. The next principle of good coffee making that we can use in our search for stronger coffee is to make sure that your Keurig machine is set to brew it’s smallest cup- preferably 4 oz or 6 oz. Our third principle of strong coffee making is to select darker roasts. Dark roasted coffee beans are roasted for longer than light roasted coffee beans. Darker roasted coffee beans not only carry the natural flavours from the coffee bean but they also carry flavours from the roasting process. These beans have a stronger flavour. A traditional dark roast are French Roast beans. My favourite variety of them is this one. But over time people’s tastes have changed and many of us like foods with much stronger flavours than was the case a few decades ago. If this is you, and you like the idea of very, very strong coffee you might want to try Death Wish Coffee. Our fourth and last good principle for making stronger coffee is to buy whole beans and grind your own. Coffee is a perishable item that begins to go stale as soon as the beans have been roasted. As part of this process, coffee loses it flavour. Ground coffee stales much more quickly than whole beans. You will have a much better chance of making a better tasting, stronger coffee. My bonus tip is actually a simple and popular DIY “hack” that makes a stronger cup of coffee by adding a second filter into a reusable K cup. This is achieved by modifying a clean used K Cup so that it sits inside a reusable cup. Detailed written instructions can be followed here and a video can be watched here. Having looked at few general tips to help us brew a better cup of coffee, let’s move and discuss factors that relate directly to your Keurig machine. The four tips that I shared with you above should help the overwhelming majority of you make a stronger cup of coffee with your K cup. However, there might be some of you who have followed that advice and are finding that their Keurig machine with the reusable cups is still not making coffee that is strong enough. And so, in this section you will find three more tips that should help you make a better and stronger cup of coffee. The video above takes you step- by- step through how to thoroughly clean every part of your Keurig coffee machine. What cleaning liquids and equipment that you will need. How to disassemble your Keurig safely. What parts are dishwasher safe. You will want to wipe and clean the different parts of your machine much more often than you will need to run a descaling cycle. But both will have a role to play in making you better cups of coffee. Many coffee loving Keurig owners are disappointed that their machines don’t make coffees that are piping hot. They believe this makes for a poorer tasting cup of coffee. In fact, it is only on a few Keurig models that you can adjust the temperature of the water manually. And so, in order to try and boost the brewing temperature for their coffee, some users preheat their machines by running a “dummy” brew before putting their reusable k cup in. Now that we have looked at the best things that you can do with your Keurig machine to make yourself a stronger coffee, it is time to move on. In the next section, I will explore what features of a reusable K Cup we need to make a better, stronger coffee. The first feature is the size of the mesh, which needs to be micro mesh. These meshes release as many good compounds and flavours as possible into the coffee while blocking bigger particles. The second feature is a metal mesh. There are lots of debates about the differences between paper, nylon, stainless steel and gold filters and which ones are better. Stainless steel and gold meshes are the most durable- with gold being the longest lasting of all. This next feature doesn’t relate directly to the strength of the coffee that is brewed. BPA (bisphenol A) is an industrial chemical that has been used to make certain plastics since the 1960s. It is thought by many people to be potentially harmful. Plastic objects that are BPA free are much safer. Built within the lid of a reusable K cup is a diffuser. This is the hole that the hot water flows into the K cup. Any reusable K cup needs some kind of diffuser in order to make sure that as the water enters the cup it is being spread over all of the coffee grounds, dissolving them all. Making sure that the water dissolves all of the grounds is a very important factor in brewing the best tasting or strongest cup of coffee. If the reusable cup is dishwasher safe it makes it easier to clean and more likely that it will be cleaned more often. Any reusable K cups that we buy need to be as simple as the original K cups to install and operate. If any modifications or additional steps that we need to take in order to make them work will make them unattractive to use. Once again, having multiple reusable K cups does not directly relate to the quality or strength of the coffee that is brewed. But it does make them much easier to use because you are not having to clean the cup out after every cup of coffee. Instead you can drink 4 cups and then clean all of the cups out at once! Why Use a Reusable K Cup? In this section I want to look at the reasons why reusable K cups are so popular. The first reason to use a reusable K cup is that compared to single use K cups, you will save lots of money. The next reason to use them is that you will save lots of “plastic waste”, which is better for the environment. Single use K cups, if they can be recycled, can’t be recycled easily. There are over 200 different varieties of coffee in K cups, which provides you with a huge choice. But, you still can’t drink any coffee that you want. But with a reusable K cup you can. Earlier in the article we talked about the connection between strong coffee and fresh coffee. You have no idea how fresh the coffee is in your favourite single use K Cup. But you do if you grind your own beans or buy freshly ground coffee. College is a social place. And one of the best places in college to socialise is a local coffee shop. But college is also a time of real financial hardship. And one of the best places in college to wreck your finances are frequent visits to your local coffee shop! Do yourself a favor and buy yourself a coffee machine. Keurig are a very well respected brand and in this post I look at six of the best Keurig coffee machines for your college dorm. Take a look at them in the chart below. Recent surveys have shown that young people are spending more money on coffee than they are on their retirement plans and that the average American is spending over $1000 per year (or $3 per day) on “take out” coffee. As I see it, there are eight features that you will want to consider most. Good Value– As a student you are on a tight budget and one thing you cannot afford is to hang out at your local coffee shop. Great Taste– You don’t want a cheap coffee maker but you do want to be able to make great tasting coffee. Personal– Buy a coffee maker that makes your favorite coffee. It is pointless buying a machine that only makes espresso, if you are addicted to lattes. Robust and Reliable– What young person takes good care of their possessions?! Small– most dormitories are quite small and so space is at a premium. Even if you want to keep it in a kitchen, most often they are shared. The K-15 is perfect for a student who lives alone in a single dorm room (where space is at a premium) and who tends to drink coffee alone. As a single serve coffee maker, with its rapid brew time and travel mug friendly design, the K-15 is very well suited to making a quick and tasty cup of coffee that you can take into lectures with you. Limited number of brew sizes. For more information and reviews, click here. This machine is compatible with K carafe pods, making it an ideal choice for a group of college students who will mostly make carafes of coffee and not single cups and for whom space is a real issue. The K- 250 is super slim and is only 8.9″ wide. It will be a perfect fit in a dorm or shared kitchen that is short on space. And its final “stand-out” feature is the touch screen control- the perfect interface for the tech savvy young people. Makes single cups and carafes of coffee. The K Cafe I think caters for one type of coffee drinkers- those that like making milk based coffees such as lattes and cappuccinos. You can froth fresh milk, soy milk or almond milk in order to add that special touch to your coffee. This is the perfect coffee machine for iced coffee lovers. The Iced Button starts a unique brewing process that will create the perfect shot of coffee to pour over ice- a shot of coffee that is full of flavour and that won’t disintegrate as it is poured over the ice. The K Select is the Keurig of choice for a student who likes strong coffee. At the press of the “strong brew” button, your coffee will become stronger and more intense. A light on the top of the machine will remind you when it is time to descale your machine as well. Perfect for those of you who need a bit of prompting now and then. 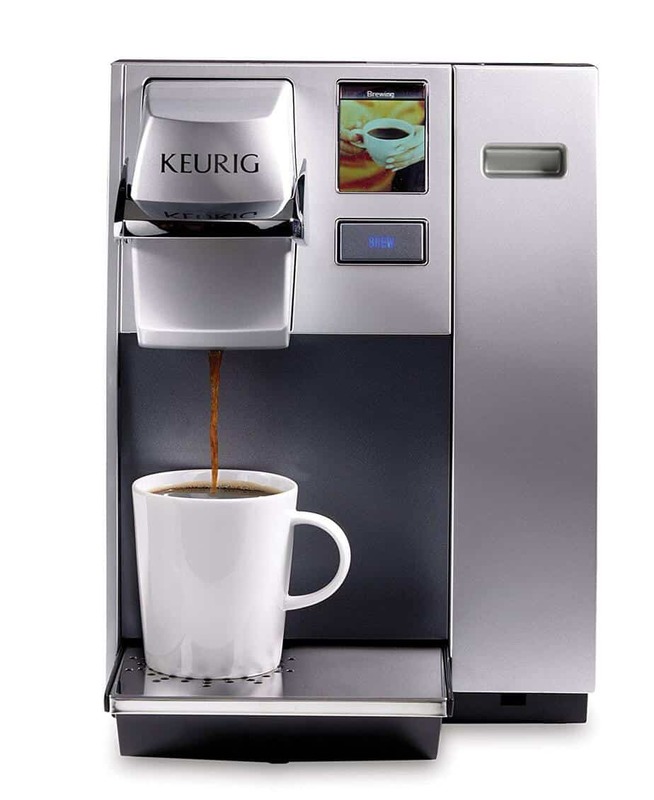 The Keurig K575 has a range of powerful features that can be used in different ways. A unique feature of this machine in my comparison is that it allows you to select from a range of five different temperatures. And if you like to drink coffees of different strengths and temperatures, then the K575 will be your best friend. And so after looking at all the different models, which one is the best Keurig for a College Dorm? For me, the model that will be the most attractive to the most people is the Keurig K Mini.